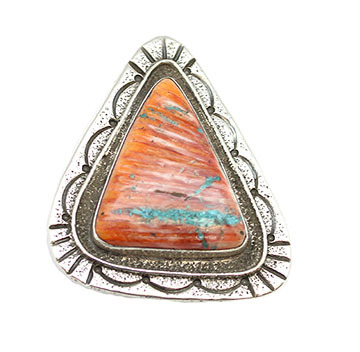 This sterling silver tufa cast ladies ring has a large triangle shape spiny oyster stone with chips of turquoise inlaid in the natural pits of the spiny. It has a good weight to it and measures approximately 2 1/4" long by 1 7/8" wide at its widest point. Crafted by Navajo artisan Virgil Reeder. Only this one available and is a size 9.